The functional organisation works well when there is a single product. But when there are multiple products and/or the products are very different from one another, the functional marketing organisation is no longer effective. The functional specialists cannot possibly coordinate all aspects of the marketing mix of each of the diverse products, with the result that some products are neglected and eventually become money losers. Such a situation given rise to the concept of product manager. 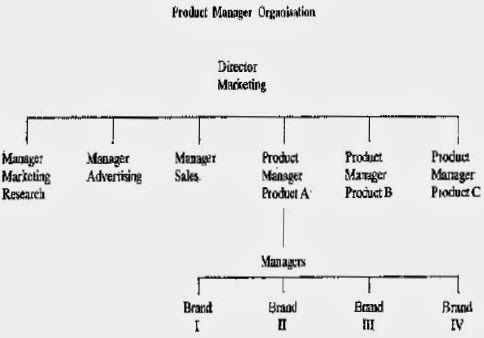 In a product management organisation, the marketing organisation is differentiated on the basis of different products. 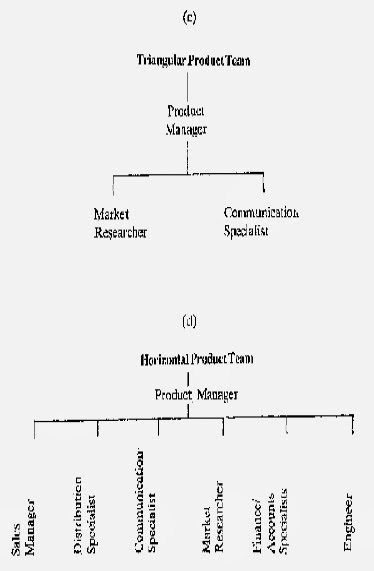 Each product or product group is assigned to a manager who is known as the product manager. The product manager is responsible for managing all aspects of the marketing mix pertaining to a specific product. Thus in a multi-product firm you would have as many product managers as the number of products. If there are many brands within. the same product, as in the case of soaps, each brand may be assigned to an individual manager who is known as a brand manager. Table-1 describes the typical responsibilities of a product manager. - interface with other departments within the organisation and outside with customers, distributors, and advertising agencies. The first three roles are self-explanatory but the last two need some elaboration. In today's competitive world, a manager's power is based on information or the access to the information he has. This is especially true in case of product manager who is a man placed in a conceptual and informational hub of the organisation. To maintain competitive position and profit of his products, with his performance starkly exposed to higher management, he must strive to be the best informed man about any aspect substantially affecting their future. He must arrange and nurture a number of information interfaces. 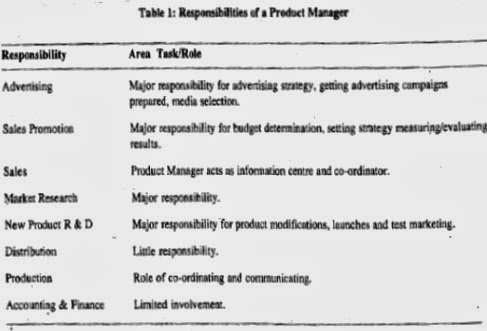 'As described in Table-1, the product manager has a number of diverse responsibilities. To discharge the responsibilities he has to interact with other departments in the firm. Though on paper the product manager is assigned all the responsibilities, but in practical terms he is rarely given the requisite authority to effectively discharge them. At best, he may be given direct authority over one or two areas say advertising and may be marketing research. For getting co-operation from the other departments he has to use all his persuasive charms and skills, which may not work all the time, resulting in conflicts and tensions. It is this interfacing aspect of the product manager's role which has potential for all types of conflicts and leads to erosion of his power. Responsibility without authority over resources could reduce the role of product manager from that of a product `mini president' to a bureaucratic clerk. Instead of being a decision maker responsible for profits the product manager is reduced to a low level coordinator. These problems can be solved by clearly defining the limits of the product manager's role, giving him authority over the resources which affect his products' profitability, taking into account areas of potential conflict between product managers and functional specialists, and establishing a system for their amicable settlement. Despite this role ambiguity and potential for conflict the product manager concept is gaining .acceptance. In Richardson Hindustan Limited (manufacturing and marketing the Vicks and Clearasil range of products) the marketing organisation comprises 20 product teams. Each product team includes junior and middle level managers representing marketing, manufacturing, R & D, and purchase. In the words of the company president, Mr. Gurcharan Das, "we tell them it is they who are responsible, and that the senior people should be looked upon as resources only. With delegation of power they are more creative, more innovative and ideas come from the lowest level". The organisation on product team basis has led to greater decentralisation of responsibility and decision-making within the company and the result is vastly improved performance. The product manager concept introduces a number of advantages into the marketing organisation. Firstly, given the increased complexity of the marketing mix and diversity of products and brand, the product manager offers a way of coping with these complex marketing inputs in a balanced way. It ensures that all products and brands get proper attention and no product is allowed to languish. Secondly, it introduces flexibility into the system as the product manager can react quickly to a changed market condition since he has the overall responsibility for managing the product’s profitability and does not have to waste time over long consultations. Quick reaction and timely action sometimes prove to be the winning factors in a fast changing market situation. Third, the product manager concept provides a focal point for integrating and co-ordinating all efforts and resources for planning and implementing the marketing strategy. Fourth, the product manager role provides excellent training for future managers, as they are exposed to all the operational aspects of management viz., marketing, finance and production. The anomaly of responsibility without control over resources, and lack of a direct line of authority lead to a situation in which conflict is always simmering under the surface, ready to explode at the slightest provocation. A product manager is in a situation which can be aptly described as `jack of all trades but master of none'. A product manager has a general and cursory knowledge of all functions but no specialised skill in any one function. This lack of expertise often puts him at a disadvantage when dealing with functional specialists, who are able to brow-beat him on technical points (often to the detriment of the product success). The product manager has usually too many interfaces to manage, which consume a great deal of his time, with the result that important strategic decisions may be delayed or even ignored. The product manager concept may turn out to be costly, as even minor products with a small sales turnover are assigned to full time managers. In recent times the product manager organisation has been undergoing a number of changes. In many firms the product manager has given way to product team. 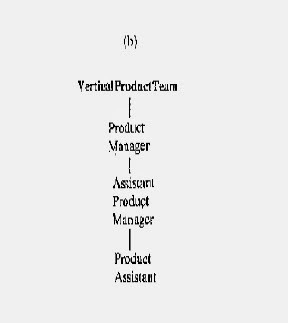 The product team may be arranged vertically or in a triangular form (Figure-I). Some other companies have introduced the concept of horizontal product teams. Each team is headed by a leader who is supported by functional specialists. This horizontal product team organisation considerably reduces the potential for conflict with other departments, since now the product manager has his own independent resource pool of functional specialists. Finally, some companies are combining two or three brands/products under one product manager. This is done when the products are individually not important enough to require full time attention or they serve similar customer needs, so that clubbing them together is meaningful and can help serve the customers better. If you wish to adopt the product management concept, you must define the role in precise terms, clearly specifying the limits of his authority. Moreover, you must bear in mind that the contribution of the product to the company's total turnover justifies the expenses of a full time product manager.